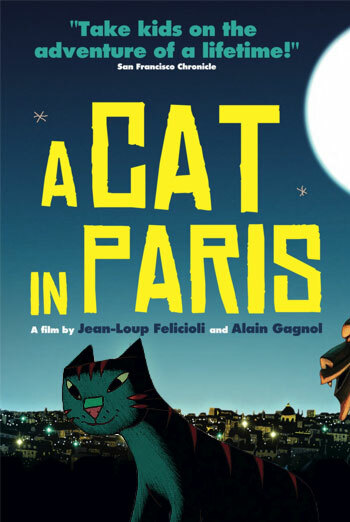 UNE VIE DE CHAT is a French animated children's film with English subtitles about a pet cat who accompanies a cat burglar at night and helps both the burglar and a police detective foil a plot to steal a priceless artifact from the Louvre. Mild violence includes a fight on the top of Notre Dame de Paris between the burglar and a gangster. During the fight a punch is seen in slow motion which causes a tooth and a single drop of blood to fly from the a man's mouth. Another fight scene sees a woman being throttled on top of a tall crane, but the woman escapes by kneeing her attacker in the crotch and performing a double ear clap.